Winter's grip is slowly loosening, slowly. We have very good water conditions aside from the temp still in the low to mid 30's. If and when the ice on croton pond goes out we will see a rise in water temp and new fish pouring into the river. Steelhead fishing will go well into May this year with these cold water temps lingering and keeping them from hitting the gravel. I have some dates still available in May and a few afternoon half days in April for anyone interested. Below are some recent pictures from the Muskegon River. 3/31/2014 A colored up hen from today. Ed and Fritz are pictured with a couple of today's fish, we had sunshine, wind and sideways snow at different times through the morning. 3/25/2014 Fritz with a hefty buck. 3/25/2014 Ed with one of his fish. Not much new to report here, it's still Winter and fishing is still pretty good. Looks like we have yet another cold snap coming our way so the good news is Spring should be here no earlier than May. Here are a few pictures from today and yesterday. 3/22/2014 Enjoying some father son time and Steelhead. 3/22/2014 Jess with a nice hen. 3/22/2014 We had a fun day on the river. 3/22/2014 Another chunky hen for Jess. 3/21/2014 Gerald put a whoopin on the Steelhead. 3/21/2014 Great weather and even better fishing. Steelhead fishing was good for us today. Here are a few pictures from the last two days. 3/20/2014 Fritz with a nice one from today. 3/20/2014 Ed with one of his, the bite was good today. 3/20/2014 Another big one for Fritz. 3/19/2014 Doug with a good buck. 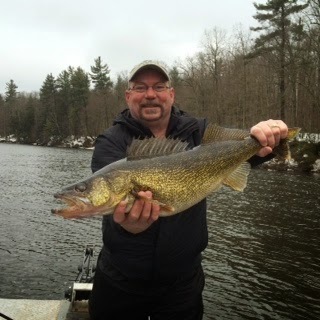 3/19/2014 Chris with one of his fish from the Muskegon River. Steelhead fishing is pretty good on the Muskegon River, water level has bumped back up to around 1,900 cfs. and water temp is fluctuating between 32 and 35 depending on the air temp. With warmer weather coming we should get a better jump in water level along with some color to put some more new fish on the move. Below are a few pictures from today and yesterday. 3/18/2014 Kris with a hefty buck from today. 3/18/2014 Jordan with one of his Steelhead from today. 3/18/2014 Kris with another plump hen in the bright sunshine. 3/18/2014 Jordan is proud of his first Steelhead landed. 3/17/2014 Ed and Fritz doing what they do. 3/17/2014 A feisty buck for Ed.